A power chain has nothing to do with weightlifting or motor boats. For you and your braces, power chains are connected rows of elastics that are used in orthodontics to help with a variety of issues. This treatment has grown in popularity recently, partly because of the versatility it offers. In modern orthodontics, there are about a dozen types of braces from which to choose. Power chains are commonly used in conjunction with the brackets attached to your teeth. 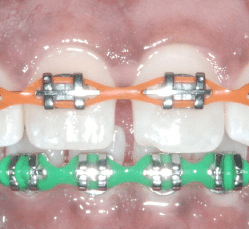 Power chains on braces are highly efficient because they add more pressure and force in moving the teeth than the traditional brackets and ligatures do alone. Used together, power chains and braces have proven effective in achieving great results in a short amount of time. Power chains are connected strings of ligatures (elastics). They are normally made from the same material that is used on the ligatures (the elastics holding the archwire to the individual brackets). In some instances, the power chains can be made of metal twists instead of elastic. While typical elastics fit over each bracket individually, power chains connect the brackets. These chains then form a continuous band that runs across your teeth. You may notice that a power chain can be used for some teeth, and others will have traditional ligatures around the brackets. This combination of ligatures and power chains allows orthodontists to address multiple treatment objectives. What Do Power Chains Do? Power chains are most commonly used to help close space. It can be used to close space after a tooth is extracted, or used for generalized spacing. Because power chains apply more force than the brackets and archwire do alone, the treatment time can be sped up. There is not a one-size-fits-all approach to power chains and braces. Several types are available, so even within the option, more options exist. Your needs will determine how widely spaced the links on the chain will be. There are different diameters between the centers of each loop (interlink space) that controls which bracket the loop fits onto. They could connect at each tooth (closed), every other tooth (short), or every third tooth (long). 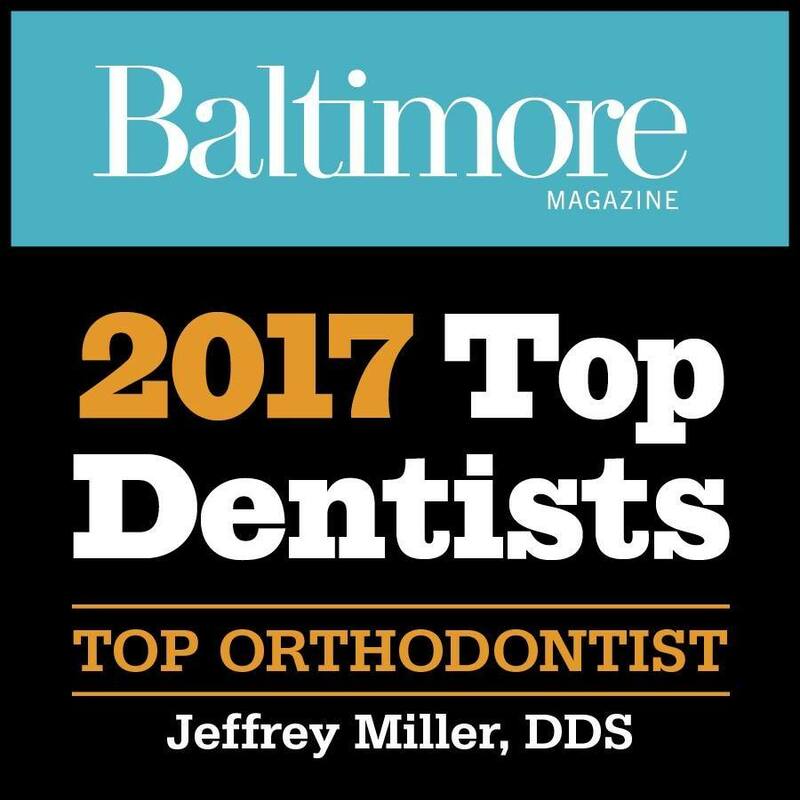 Your orthodontist will take a more active role in determining the type that is best for you, which is usually based the clinical objective at hand. How Long Will I Have Power Chains? Much like many questions that involve the duration of a treatment in braces, it depends on each individual case. The exact length of treatment will vary between individuals. Some people will wear power chains for six months, while others will complete their treatment after just six weeks. 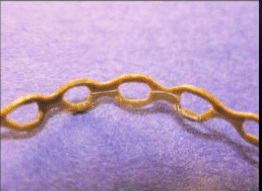 Even after the particular issue for the power chains being used on the braces may have been resolved (like closing a gap), the orthodontist might keep them on to stop it from reverting back—almost like a retainer will. Unlike some orthodontic treatment methods where a person’s age can play a part in the type of treatment, anyone is a candidate for the use of a power chain throughout treatment. This means you and your teenager can even wear power chain braces at the same time (which we promise he will love!). 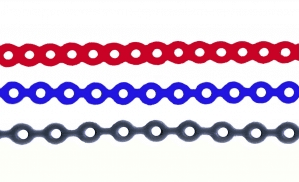 A selection of colors for power chains. 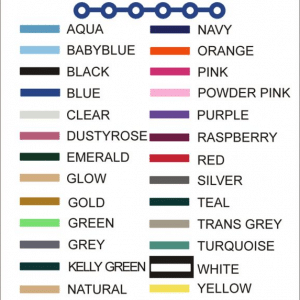 Power chain color options are exactly the same as normal ligature color choices. Your orthodontist will help you choose a color that is most fitting to your lifestyle, but ultimately you will get to decide what color you would like to wear. Power chains are changed at every visit, so if they do stain, don’t worry about it too much. You can try a different color or get a whole new set. As with any adjustment, there will be some discomfort as new force is applied to your teeth. 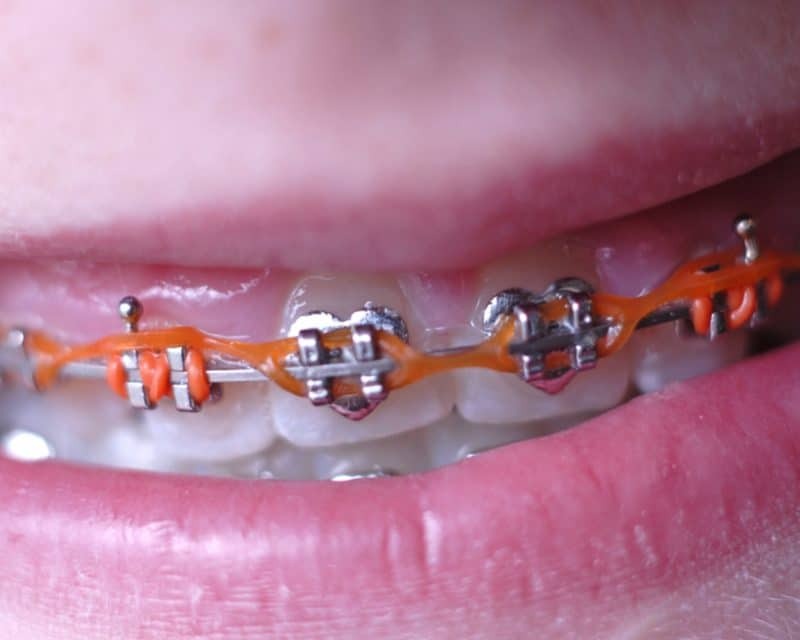 Power chains on braces do not cause significantly more pain than any other type of treatment. You will likely be sore for a few days after the orthodontist applies and adjusts them. Your orthodontist will tell you how best to manage that time and how to get some relief from the discomfort. Any tenderness you are experiencing should resolve relatively quickly. During this time (and throughout the rest of your time in braces) it is important to follow your orthodontist’s guidelines about which foods to eat and which to avoid. Long story short, power chains are just another part of your orthodontic treatment. It is important that you follow the same oral hygiene habits as you would with traditional metal braces or other orthodontic options. You may find that you will have more food trapped in the elastics, but it is not a serious amount. You may have to spend a little more time brushing, too. As always, poor oral hygiene, even for a short period of time, can extend your treatment time and potentially damage your teeth and gums. Power chains are used in the majority of orthodontic cases and are a routine part of orthodontic treatment. Your power chain will help to close up any spaces you may have allowing you to smile more confidently in no time!